I only choose projects that feel fully integrated with who I am and what I want to put in the world. I’m pretty lucky that I get to operate that way, and I’ve worked hard to be in this place both internally and externally. I just finished a big 2 month project : bringing Aloha to New York City in the form of out-of-this-world Hula dancers and musicians and 18 gorgeous modern dancers dressed in elaborate costumes that evoke the land of Hawaii. 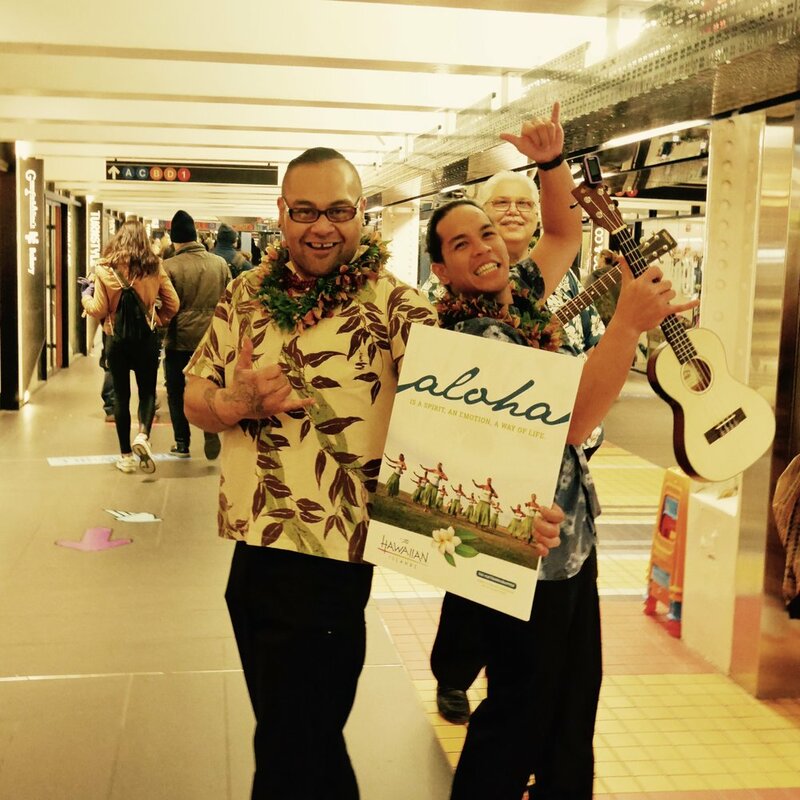 We were hired by the Hawaii Visitors and Convention Bureau to bring these Random Acts of Aloha (coined by the CMO) to NYC. We had 4 performances pop-up in different locations around manhattan. It was a lot of work, and it was a dream project. But here’s what matters most : it was important to me that the feeling of aloha, oneness, joy in the present moment, love, the spirit of Hawaii happen throughout every aspect of this project. One of the costumes makers said, “This project is saving my life right now. I’m really needing to be creative in this way.” Many of the P.A.s said that this was one of the best gigs they’ve ever worked. The make-up artists said they were happy to be a part of the magic. One make-up artist said with her eyes big and jaw agape, “Wow, something .. really .. special is going on here. I’m so glad to be here.” The modern dancers said things like, “Thank you for bringing aloha into my life, this is really something wonderful” and “This is an experience I will never forget. Thank you for the incredible opportunity to give and receive aloha” and “I’m so happy I got to be a part of this. The spirit of Hawaii will be with me always”. This feeling expressed by our team, this matters for them personally and it matters for the campaign because as we allow ourselves to be bigger we can transmit that magic to the world. I heard things from the public like, “ Look what’s come to our city! And someone handed me this flower! I want to book a ticket now!”. I think this is beyond costumes and world class dancers. I think this is an embodiment of something powerful and beautiful. this story is a metaphor for our lives…. Though I was the creative director, it’s not about me. It’s about something bigger. It’s ALWAYS about something BIGGER. The more we can live big in ourselves and our hearts, the more we can create a vortex of aloha, the more we can create the space for the people around us to live BIG (true, authentic, powerful, alive, glorious), the better for the world, the whole world. I really believe this. Aloha, from my heart to yours.